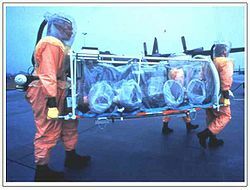 Virologists working with level 4 diseases must wear biosafety suits such as these. Virology involves the study of viruses, their ecology, classification, and structure. Those who choose this field of work are referred to as a virologists. Virologists study, research, and sometimes find vaccinations for viruses. Virologists can have different levels. The levels are 0-4 without a level one. These levels measure the harmfulness of the viruses virologists work with. Level 0 virologists would deal with viruses such as the common cold. Level 3 would contain viruses such as AIDS. Level 4 deals with the most dangerous viruses. These include Marhburg, Ebola, and Hanta. Level 4 viruses require the most protection. The virologists who deal with these types of viruses must wear bio-safety suits. There are only two level 4 facilities inside the U.S. which have the ability to study these types of viruses: the Center for Disease Control and Prevention (CDC) in Atlanta, and The United States Army Medical Research Institute for Infectious Diseases (USAMRIID) in Maryland. The Atlanta CDC facility where level 4 viruses are studied. Virologists may work in varied locations. These locations may range from a rain forest in Africa, to a local hospital, and even a level four lab. Virologists may even help develop vaccines while working for pharmaceutical companies. Despite attempts to understand the growth of virus in cells occupies most of the efforts of the virologists in recent years, viruses are still a major cause of human diseases. To become a virologist one must go to school for several years. The number of years depends on the field of virology. Virologists must study several different areas of science. These include epidemiology, microbiology, chemistry, molecular biology, and virology. A wide range of procedures has been developed for cultivating viruses. In the vast majority of cases it is necessary to supply the virus with appropriate cells in which it can replicate. In a few cases it is possible the cultivation of viruses in cell-free systems. In animal viruses, the culture system for growing a virus consists of living cells and the choice stays among three types of culture systems: living animals, organ culture (e.g. pieces of brain) or cell cultures. The later is divided among three types of cell cultures: primary cells, cell lines and permanent cell lines. Before the advent of cell culture, many viruses were propagated in embryonated chicken eggs. The virus can be isolated from an infected host collecting material excreted by or secreted, and testing blood or tissue to induce the same symptoms identical to a host, or by the induction of some abnormal pathology in a host substitute or in cell culture. After the virus has been propagated, it is usually necessary to remove contaminants before the sample be in conditions to be studied in the laboratory. One of the most common methods for this is centrifugation. Centrifugation can be differential or by density gradient. A major issue is the ability to recognize a viral infection in the host. Initially, as the virus were recognized for their infectivity, the early methods focused on this property, more sensitive and informative. More recently, molecular diagnostic techniques have been developed. An infective assay measures the concentration (known as the titre) of infective virus in a specimen or a preparation. There are Several classes of assays measuring number of infectious units. Among them, the plaque assay, fluorescent-focus assay, infectious center assay, transformation assay and endpoint dilution assay among others. Virus genetics involves a number of issues such as genome sequencing, manipulation of viral genomes and the investigation of gene function and expression. The study of the genome involves other important issues such as the study of genetic drift and antigenic drift. An example is the influenza virus, subject both to genetic drift and antigenic drift. 1774 Farmer Benjamin Jesty vaccinated his family members using cowpox taken from an infected cow's udder to create immunity in his family and wrote about what happened. Edward Jenner studied these and other events and became accredited as the first to intentionally vaccinate to prevent infectious disease. 1885 Louis Pasteur used the term "virus" to describe the rabies virus which he experimented with. He created the terms "vaccination" and "virus" to honor Edward Jenner. He also created a scientific basis to follow Edward Jenner's approach to vaccination. 1886 John Buist took a smallpox patient's lymph from their skin lesions. He found "elementary bodies" in this lymph sample. Those elementary bodies were actually particles of the smallpox virus. 1892 Dmiti Iwanoski became the first person to distinguish the difference between viruses and other infectious agents. 1898 Martinus Beijerinick developed the concept that the virus is an entity.Also in 1898 Freidrich Loeffler and Paul Frosch proved that viruses could infect both animals and plants. 1900 Walter Reed discovered that mosquitoes were capable of spreading yellow fever. 1908 Erwin Popper and Karl Landsteiner became the first people to discover that humans could be infected by viruses. 1911 Francis Peyton Rous became the first prove that a virus had the ability to cause cancer. 1915 Frederick Twort found viruses that could infect bacteria. 1917 Felix d'Herelle created the term bacteriophage to describe viruses that could infect bacteria. 1935 Wendell Stanley demonstrated that the tobacco mosaic virus could still be infectious even after crystallization. His works became the first step to characterize a viruses molecular structure. 1938 Max Theiler created a vaccine to prevent yellow fever. 1939 Emory Ellis and Max Delbruck created the idea of the one step virus growth cycle. 1940 Helmuth Ruska became the first to take pictures of virus particles using an electron microscope. 1941 George Hirst became the first to create a rapid method of measuring eukaryotic viruses. 1945 Salvador Luria and Alfred Hershey proved that bacteriophages had the ability to mutate. 1949 John Enders, Thomas Weller, and Frederick Robbins used human tissue culture to grow the polio virus in vitro. 1950 André Lwoff and his colleagues created the term prophage by discovering lysogenic bacteriophages inside Bacillus megaterium using ultra-violet light. 1952 Renato Dulbecco demonstrated that bacteriophages are similar to animal viruses in the way that they can form plaques. 1957 Heinz Fraenkel-Conrat and R.C. Williams demonstrated that virus particles form spontaneously when mixtures of purified TMV RNA and a coat protein were incubated together. 1961 Sydney Brenner, Francois Jacob, and Matthew Meselson demonstrated that virus protein synthesis was directed by bacteriophage T4 using host cell ribosomes. 1967 Nark Ptashne isolated and studied the repressor protein. Also in 1967 Theodor Diener discovered viroids. 1970 Howard Temin and David Baltimore found reverse transcriptase in retroviruses. 1975 Bernard Moss, Aaron Shatkin, and their colleagues demonstrate that correct processing during translation is affected by messenger RNA containing a nucleotide cap at the 5' end. 1976 J. Michael Bishop and Phillip Sharp discover gene splicing. 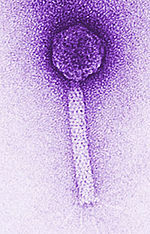 1979 The virus smallpox was declared to by the World Health Organization to be eradicated. 1981 Yorio Hinuma and his colleagues found patients with the adult T-cell leukaemia and isolated the human T-cell leukaemia. 1982 Stanley Prusiner discovered that scrapie was caused by prions. 1983 Kuc Montaiguer and Robert Gallo announced that they had discovered HIV. 1985 The USDA gave the first license to market GMOs. 1986 Roger Beachy, Rob Fraley and their colleagues helped provide a better understanding of plant's virus resistance by demonstrating that tobacco plants had formed the coat protein of tobacco mosaic virus are resistant to the TMV virus. 1994 Yuan Chang, Patrick Moore, and their colleagues had identified the human herpesvirus 8. 1999 The number of cases of people who had AIDS or HIV had risen to 33 million. ↑ 1.0 1.1 Condit, Richard C. (2006). "2 Principles of Virology". In Knipe, David M.; Howley, Peter M.. Fields Virology (5th ed.). New York: Lippincott Williams & Wilkins. p. 25-58. ISBN 978-0-78176060-7. ↑ Fields, Bernard N.; Knipe, David M (1991). "1 Introduction". In Fields, Bernard N.; Knipe, David M.; Chanock, Robert M.; Hirsch, Martin S.; Melnick, Joseph L.; Monath, Thomas P.; Roizman, Bernard. Fundamental Virology (2nd ed.). New York: Raven Press. p. 3. ISBN 0-88167-683-7. ↑ 4.0 4.1 4.2 4.3 Carter, John; Saunders, Venetia (2007). Virology: Principles and Applications. New Jersey: John Wiley & Sons. p. 11-29. ISBN 978-0-470-02387-7. ↑ Dimmock, N. J.; Easton, A. J.; Leppard, K. N. (2007). "2: Some Methods for Studying Animal Viruses". Introduction to Modern Virology (6th ed.). Malden, MA/Garsington Road, Oxford: Blackwell Publishing. p. 18-19. ISBN 1-4051-3645-6. ↑ 6.0 6.1 6.2 Flint, S. J.; Enquist, L. W.; Racaniello, V. R.; Skalka, A. M. (2004). "2: Virus Cultivation, Detection, and Genetics". Principles of Virology: Molecular Biology, Pathogenesis, and Control of Animal Viruses (2nd ed.). Washington, D.C.: ASM Press. p. 30-44. ISBN 1-55581-259-7. ↑ Webster, Robert (1999). Esteban Domingo; Webster, Robert; Holland, John. ed. Origin and Evolution of Viruses. San Diego: Academic Press. p. 378-379. ISBN 0-12-220360-7. ↑ Jäger, Joachim; Pata Janice D (2002). "2.1: Viral RNA-Directed Polymerases:Structure and Function Relationships". In Holzenburg, Andreas; Bogner, Elke. Structure-Function Relationships of Human Pathogenic Viruses. New York: Kluwer Academic/Plenum Publishers. p. 68-69. ISBN 0-306-46768-2.